When was the last time you had an artichoke? They sure are a lot of trouble but so worth it when you put that last bite of the heart dipped in butter or aioli into your mouth. A form of a thistle, the artichoke comes from the flower bud of the plant before the flower comes into bloom. The wild form of the plant called cardoon, traces back as a food to the ancient Greeks and Romans. Today, artichokes are consumed in many areas of the world, particularly in the Mediterranean area. In the U.S., California produces almost 100% of the artichoke crop. I’m still grilling and for today’s post I’ve prepared a salad with grilled artichokes, asparagus, shrimp, roasted tomatoes, and a lemon tarragon aioli. Light and healthy, this salad is satisfying enough for dinner but smaller portions serve as a great appetizer. Place all ingredients in a small bowl and whisk to combine. Cover and refrigerate for 30 minutes. 1. Preheat oven to 450 degrees. Place tomato halves on a baking sheet, drizzle with olive oil, and season with salt and pepper. Place baking sheet in oven and roast for 15 minutes. Remove from oven and cool completely. 2. Cut the top 1/3 off of artichokes. Remove a few outer leaves and clip the sharp points off of remaining leaves with kitchen shears. Peel the outer layer of stem with a vegetable peeler. With a paring knife, cut out the choke (fuzzy) part in the center of each artichoke half. Prepare a vegetable steamer over boiling water and steam artichoke halves for 15 to 20 minutes or until base of artichokes are easily pierced with a fork. Remove from heat and cool. 3. Brush both sides of each artichoke half with olive oil and season with salt. Preheat grill to high heat. Place artichoke halves cut side down on grates and grill for 3 to 4 minutes until slightly charred. Turn over and grill for 3 to 4 minutes. Remove from grill and set aside. 4. Drizzle asparagus with olive oil and season with salt and pepper. Grill for 4 to 5 minutes turning regularly until slightly charred. Remove from grill. 5. Drizzle shrimp with olive oil and season with salt and pepper. Grill for 3 to 4 minutes on each side until shrimp are opaque and pink. Remove from grill. 6. Drizzle arugula leaves with olive oil and balsamic vinegar to taste and toss. 7. Divide arugula between plates. Top each plate with 2 artichoke halves, asparagus, tomatoes, and shrimp. Serve with aioli. 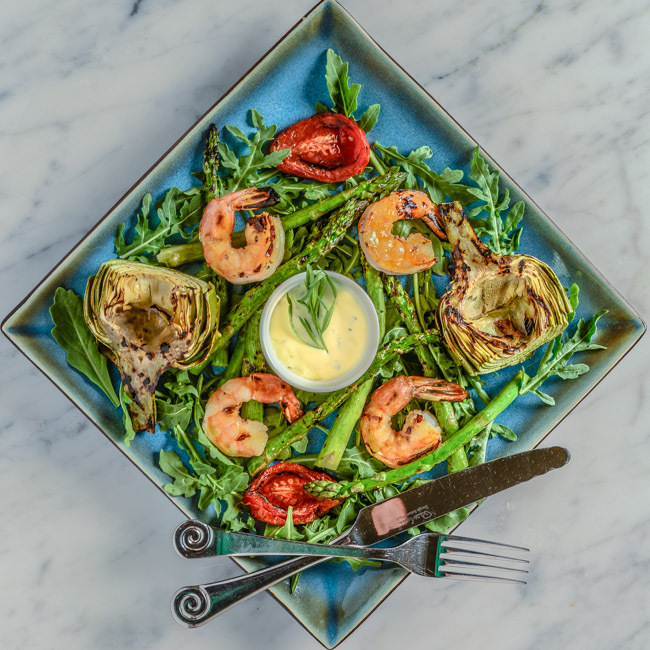 I love artichokes but have never cooked them – these grilled artichokes combined with asparagus and shrimp sound wonderful and look totally decadent! My mom used to make artichokes with hollandaise for dinner when i was a kid. I haven’t made them for years. Love that you made this aioli to go with it. What a beautiful salad! Perfect for this time of year where you can grill the ingredients. I love artichokes! Never have grilled one though — I gotta try this. Amazing looking salad — thanks. You did a really nice job with this dish. Oh wow Bill, that looks so incredible!!! !